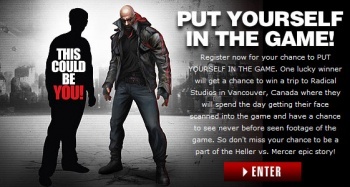 A new GameStop contest may give you the opportunity to mutilate your digital self in Prototype 2. Teaming with the games retail giant, Activision and Radical Entertainment are giving one eager fan a chance to appear in the upcoming Prototype 2. Just pre-order the game between now and September 1, plop down five bones, register for the raffle through GameStop's contest page, and cross your fingers. Oh, and make sure you're over 18, and that the game was pre-ordered in the U.S. or Canada. The randomly-selected raffle winner will receive a trip for two to Vancouver, including a tour of Radical Entertainment's HQ. Something was also mentioned about a facial scanning procedure, but that sounds like safe science to me. Don't sweat it. "In addition to just seeing themselves in the game, the winners will actually be able to locate their virtual selves and shape-shift Sgt. James Heller into their likeness," said Ken Rosman, studio head at Radical. The winner will also view brand new game footage, which would be awesome for Prototype fans or people who just want to brag. So, what do you think? Is this a strong pre-order incentive, or do you prefer character skins, early map access, and other common bonuses? Prototype 2 is currently scheduled for release on April 24, 2012, but remember, this contest only runs until the first of September.